She was my Functional Katherine J. 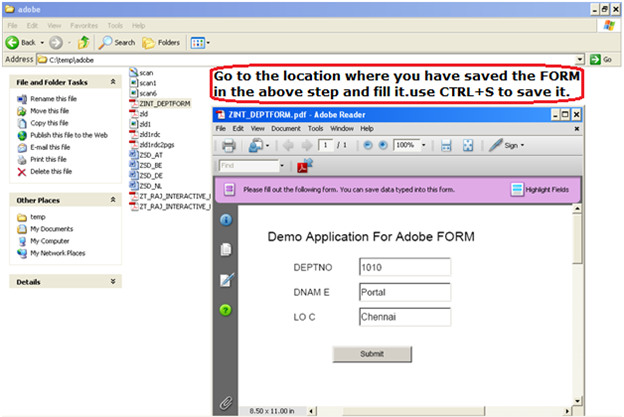 Develop a Webdynpro application from where user can download the PDF FORM in his/her local system. 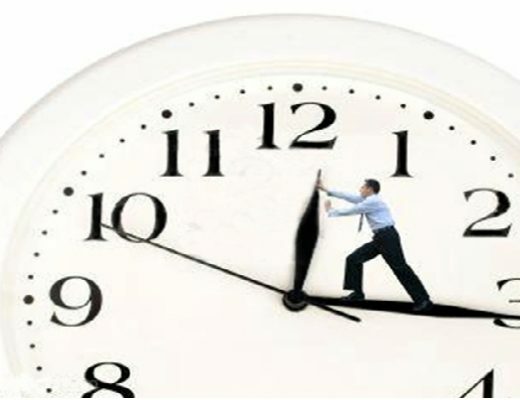 After filling the FORM, he/she can upload the FORM from the same application. This application should also have the option to fill the FORM ONLINE. 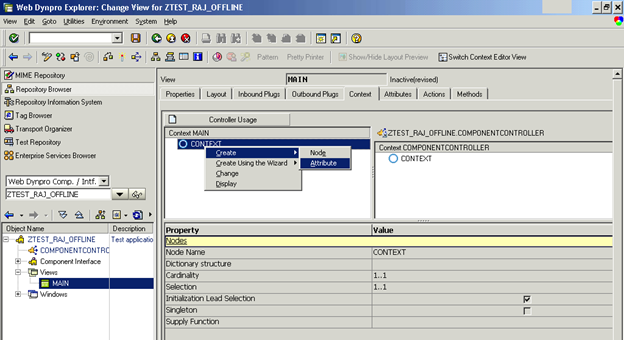 Go to Transaction code SE80 and create a Webdynpro for ABAP component named as ZTEST_RAJ_OFFLINE . go to the Main view of your Webdynpro component and Right click on the ROOTUIELEMENTCONTAINER.Create a Interactive form named INT_DEPT_FORM. FILE_UP_LOAD which is of type FileUpload. Upload (Button) which is of type Button. Step 4 : Now Go to Context tab of your Main view To create the required Nodes and elements. When katherine upload the file from her local Computer, to read it we need to put it in side a element. So will declare a Element which is of type XSTRING. 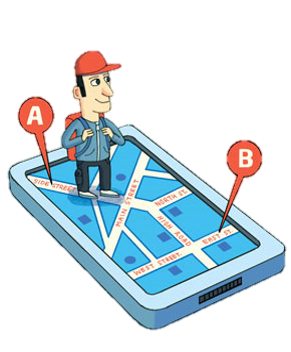 To Store the FORM data like Dept No, Dept name and location we also need A Node of which contains this information. Now it’s time to map the data with layout. Go back to your layout tab.double click on the FILE_UP_LOAD Elements. 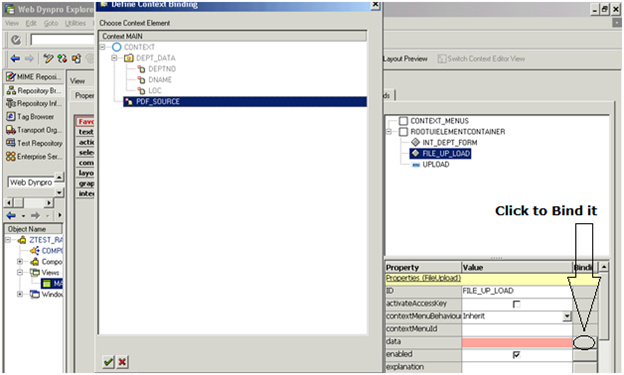 Go to Property data and Bind it with the PDF_SOURCE of your context. 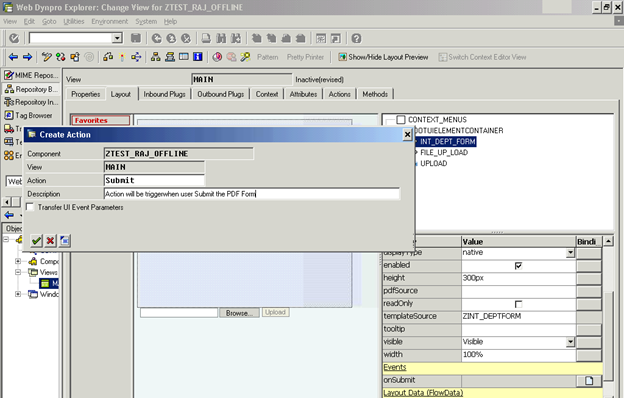 Now Double click on the Element INT_DEPT_FORM.and enter the name ZINT_DEPTFORM in the Template source .Click Enter. It will prompt you for Specifying the interface name. 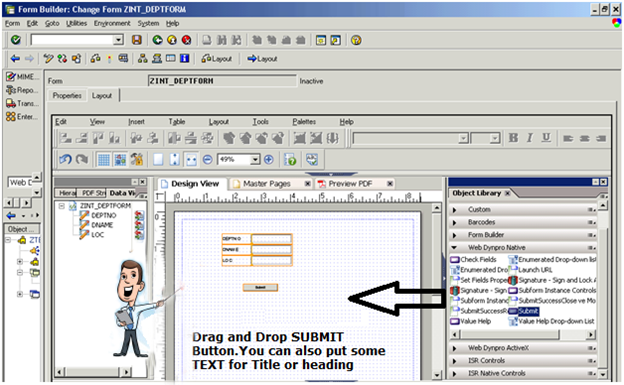 Give any name say : ZINT_DEPTFORM_INTF and click on the CONTEXT Button. 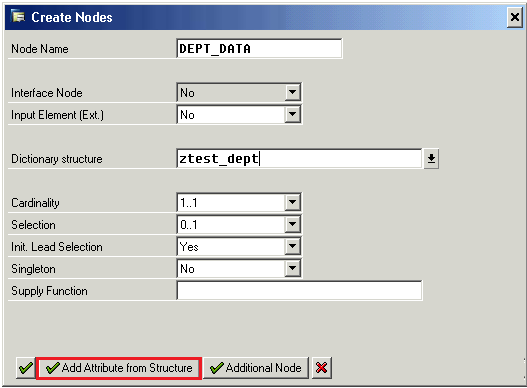 Select your Dept_data node and click enter. 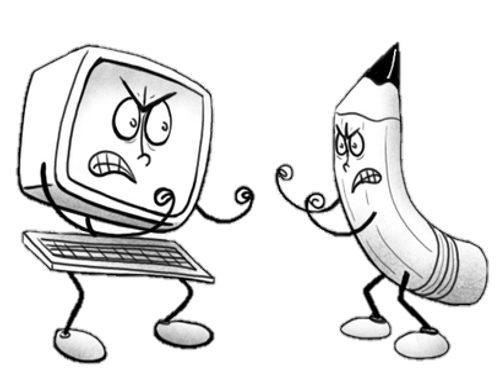 It will open Adobe Form Designer. 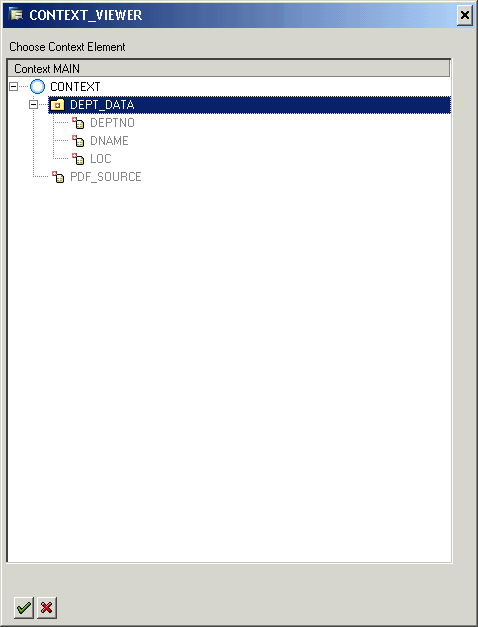 Select the data DATA View from the left panel where you can see yours Dept_data Node. Drag it to the Right side part on design view. Work on the Alignment part. Also put one Submit Button from the Object Library (Palettesà Object Library).From Webdynpro Native. 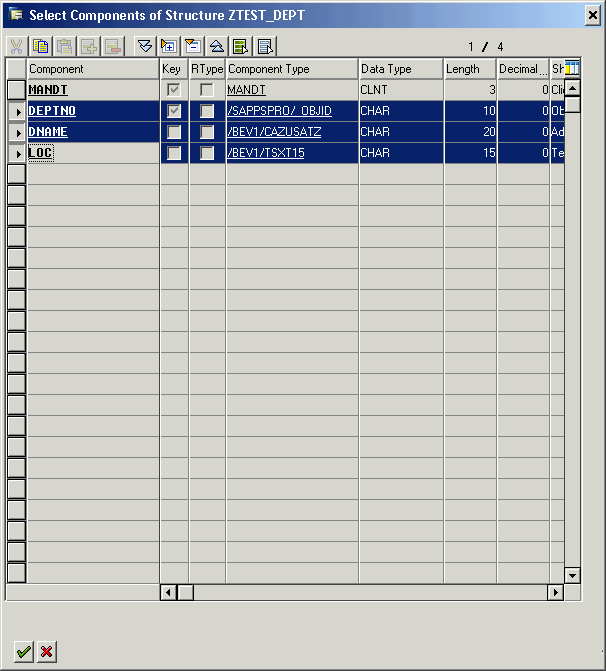 ZCI Layout (called as Zero client installation layout). Utilities à Insert the Webdynpro Script . Save and activate the FORM+interface. 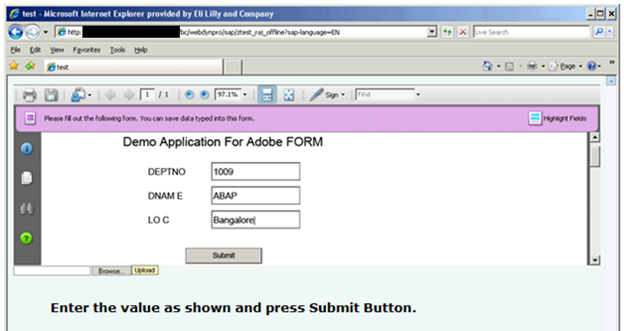 Code to read and save the data from the FORM when user submit the form ONLINE. 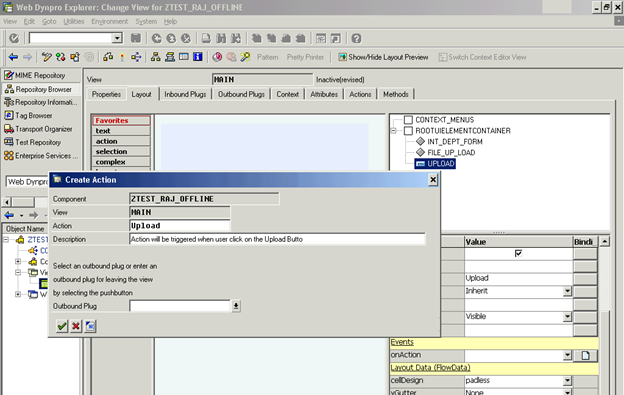 Code to read the PDF file when user upload it and save the data into database table ZTEST_DEPT. Starting with the First part. Check the Check box Active. When User submit the FORM by clicking the SUBMIT Button in the FORM. It will trigger the Event. To trigger a method for this Event. 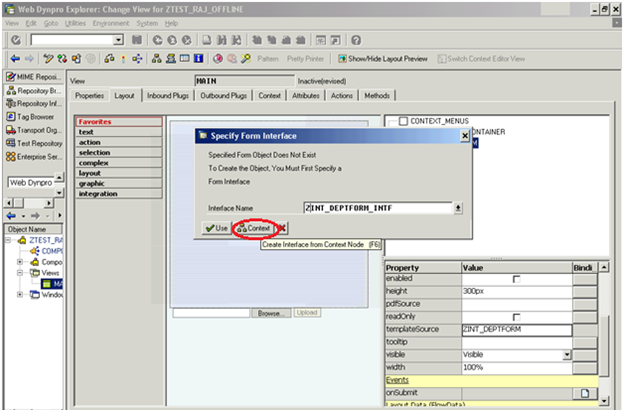 just click on the Create Button for the OnSubmit Property of the INT_DEPT_FORM Element. This Will Internally Generate a Method called ONACTIONSUBMIT. (The naming convention is like ONACTION<Action name>. )You can see this method in the method tab of your Main View. Put the below code inside the Method. 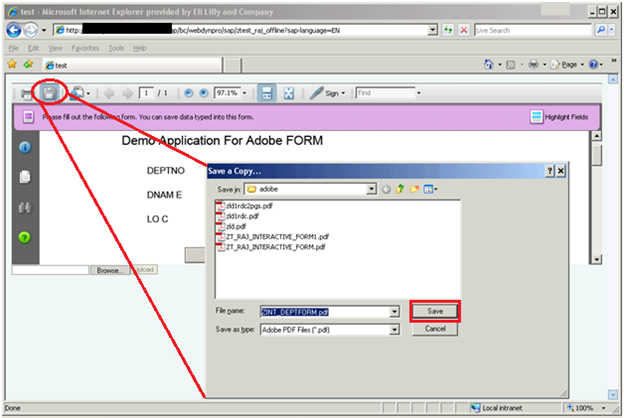 Explanation: when user fill the data inside the Form it will automatically seats in the Context of the Main view as it is mapped with the Adobe form Interface. So your job is to read that data and simply insert it into database. data : wa_dept type ztest_dept. lv_node = wd_context->get_child_node( NAME = ‘DEPT_DATA’ ). When user upload the file code should be there to read the data from the file and save it into database table ZTEST_DEPT. Double click on the Upload Button element. 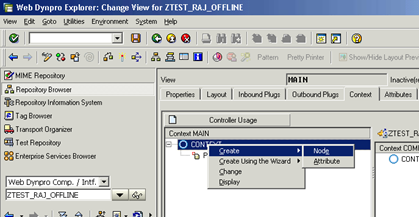 Go to its Properties and click on the Create Icon to create an Action. Explanation: This code reads the PDF file which is Uploaded by the user and extract the Dept name , Dept No and location from it and save it into the database table Ztest_dept. DATA lo_el_context TYPE REF TO if_wd_context_element. 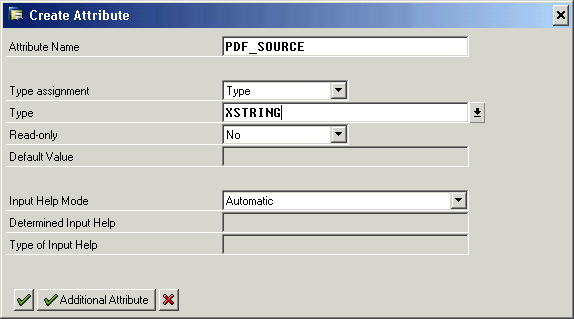 IMPORTING value = lv_pdf_source ). DATA: l_fp TYPE REF TO if_fp. l_pdfobj->set_document( pdfdata = lv_pdf_source ). l_pdfobj->get_data( IMPORTING formdata = pdf_form_data ). * Call method to convert xstring to string. 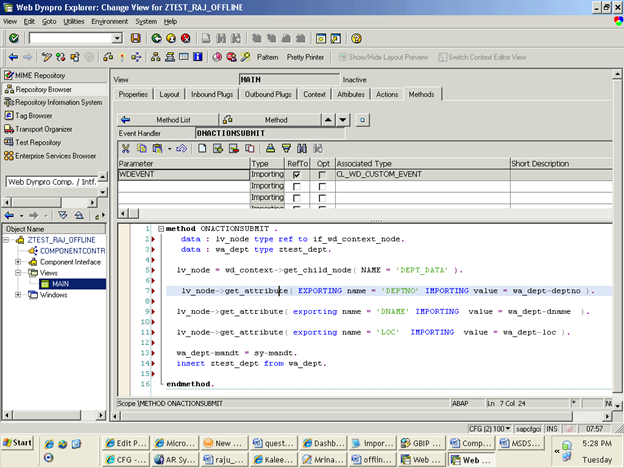 converter = cl_abap_conv_in_ce=>create( input = pdf_form_data ). DATA: l_ixml TYPE REF TO if_ixml. istream TYPE REF TO if_ixml_istream. istream = streamfactory->create_istream_string( formxml ). DATA: document TYPE REF TO if_ixml_document. 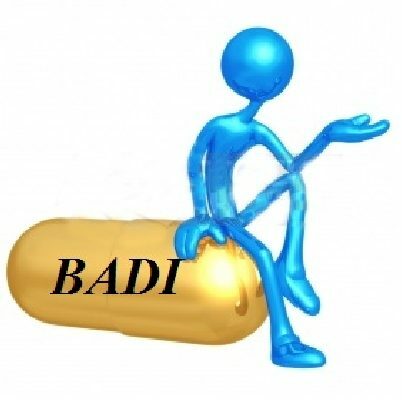 DATA: parser TYPE REF TO if_ixml_parser. * Start parsing theDocument with parsing interface referenced. IF node IS NOT INITIAL. IF fs_dept IS NOT INITIAL. 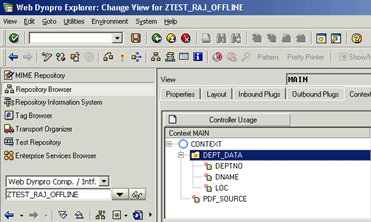 INSERT into ztest_dept VALUES fs_dept. 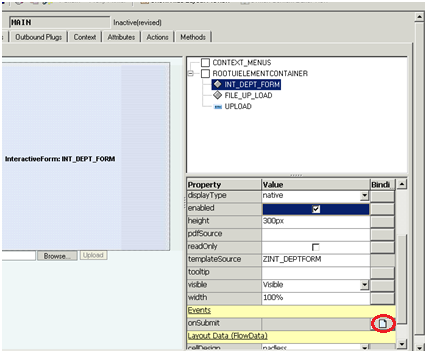 Save and activate your wendynpro component. Call your beautiful User Katherine to test this functionality. You should see the Below Screen. 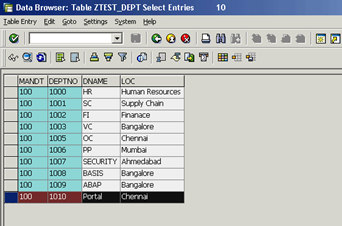 You should see the one entry created in the ZTEST_DEPT table via SE16. This is what ADOBE FORM has delivered out off the BOX functionality. You can’t achieve this using any HTML Forms. Just like a normal word or excel file it will store the data which you have filled. 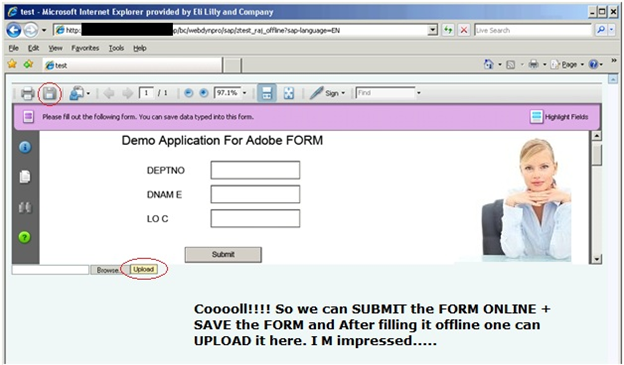 Execute your application again and upload this form. 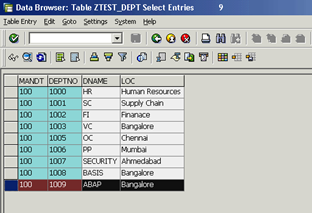 Once you click on the UPLOAD Button you can see that entry reflected in the ZTEST_DEPT table. 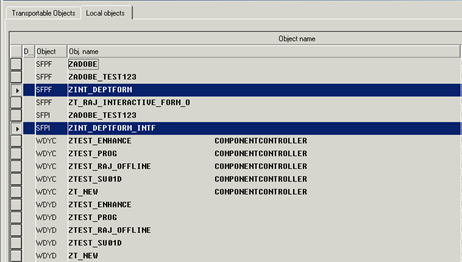 Note : if something is not working out you can put the debugging point inside your onactionsubmit / onactionupload method.